NASA: Europa Spacecraft Goes Into Development Phase : The Two-Way The probe would make dozens of flybys of the Jovian moon in an effort to study its vast subterranean ocean that could harbor life. 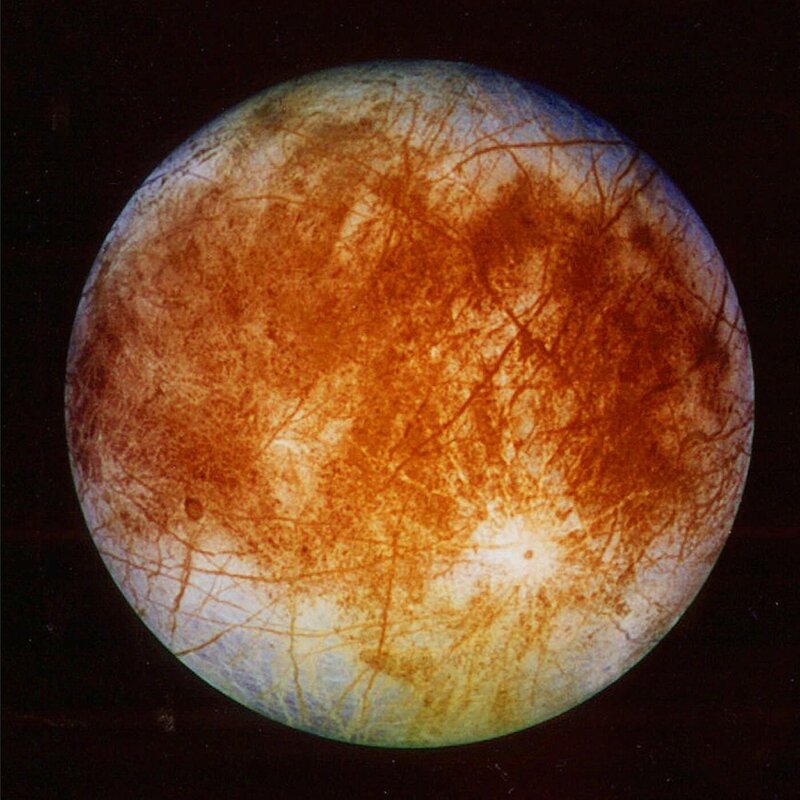 An image of Europa released by the Jet Propulsion Laboratory in Pasadena, Calif., in 1996 by the Galileo spacecraft. NASA says a new probe dedicated to studying the Jovian moon, is going into the development phase. NASA has moved a step closer to sending a probe to one of Jupiter's "Galilean" moons, Europa, which is believed to contain a vast liquid ocean that could harbor life underneath an icy surface crust. In an announcement on Wednesday, the space agency said its mission concept for a Europa probe had completed its first major review and was now entering the development phase. "[We're] taking an exciting step from concept to mission, in our quest to find signs of life beyond Earth," said John Grunsfeld, associate administrator for NASA's Science Mission Directorate in Washington. "Observations of Europa have provided us with tantalizing clues over the last two decades, and the time has come to seek answers to one of humanity's most profound questions." Europa is one of Jupiter's four largest natural satellites, known as Galilean moons because they were so large that Galileo Galilei was able to see them circa 1610 in one of the world's first crude telescopes. Io, Callisto and Ganymede are the others. According to NASA: "The mission plan calls for a spacecraft to be launched to Jupiter in the 2020s, arriving in the distant planet's orbit after a journey of several years. The spacecraft would orbit the giant planet about every two weeks, providing many opportunities for close flybys of Europa. The mission plan includes 45 flybys, during which the spacecraft would image the moon's icy surface at high resolution and investigate its composition and the structure of its interior and icy shell." Space.com, quoting NASA officials last month, said the probe would "carry super sharp cameras, a heat detector, ice-penetrating radar and a variety of other gear that will shed light on the satellite's surface composition and the nature of its salty subsurface sea, among other things." "Astrobiologists regard the 1,900-mile-wide (3,100 kilometers) Europa as one of the solar system's best bets to host extraterrestrial life. "Europa possesses a salty ocean beneath its ice shell, and this sea is apparently in contact with the moon's rocky mantle, making possible a number of complex chemical reactions, scientists say. In addition, scientists think that Europa's seafloor also features hydrothermal vents, providing a potential energy source for life-forms, if any exist in the dark depths. (Life thrives at Earth's undersea vents, and some researchers think these environments gave rise to the planet's first organisms.)"